The redevelopment and restoration of the Grade II listed Darlington Civic Theatre has returned this much-loved Edwardian building back to its former glory with significant design improvements. It is due for completion late 2017 when it will re-open under its original name, Darlington Hippodrome. The theatre was built in 1907, and after a series of piecemeal extensions and decades of poor maintenance, this cultural asset had fallen into a state of disrepair that required significant capital investment to carry out the restoration programme necessary to sustain and develop it for current and future generations. Darlington Borough Council tendered in 2014 for a design team to undertake the new build, restoration, remodelling and refurbishment programme. 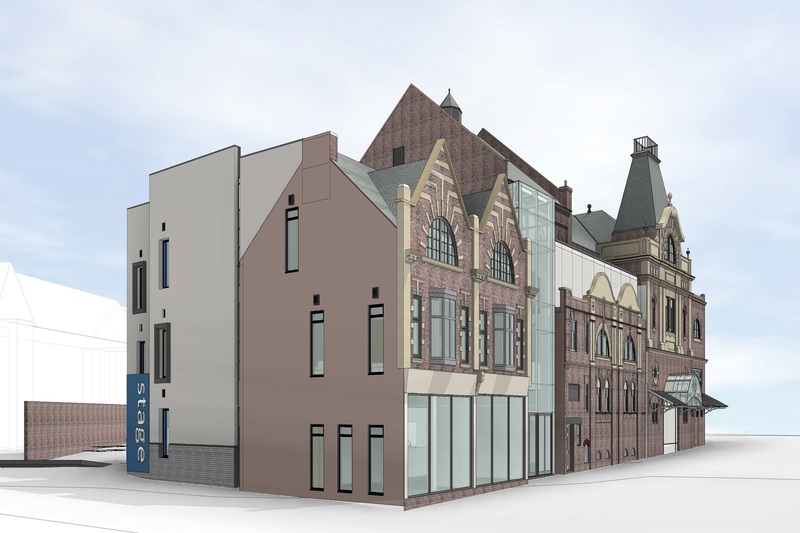 Construction of the £11.7 million project began in 2016 with £4.6 million Heritage Lottery funding, in addition to £1.5 million Arts Council funding for a new theatre dedicated to young people which will be named The Hullaballoon - this will be the only children’s theatre in the UK outside of London. Both sets of funding were granted based on the strong stakeholder engagement by Space Architects and their in-depth understanding of the specialist services required for theatre design. Maximise space utilisation within the restricted confines of the building through the removal of underused cellular accommodation and the creation of new state-of-the-art technical and back of house facilities. Maintain and restore the Grade II historical fabric of the building to revitalise its original splendour. Deliver the construction phase within an 18-month programme to minimise losses to existing revenue streams and community disruption. The Space Architects’ approach necessitated a thorough understanding of the building to stay true to its authenticity, maintaining its grandeur and impressive features, yet create spaces for modern standards of production. This was a genuine conservation project, with people who cared for the building, so considerable thought had to be given in the early design stages to identify the end use and to make it fully accessible. Space Architects engaged with advisory bodies from the outset including; Heritage Lottery Fund, Historic England, the Theatres Trust, the Arts Council and many other stakeholders associated with the theatre and Darlington Borough Council. Space hosted a series of engagement sessions, consultation days and interactive workshops to ensure the design of both theatres were representative of the needs of the key audiences, as well as creating a space which is exciting and ground-breaking in its offering. A rigorous assessment of all design options was undertaken to determine the correct solution that would ‘design out’ the risk for costs and health and safety. Modern methods of construction were vital to deal with the complex logistical phasing and the challenges of public access, movement and wayfinding issues. Utilising BIM, therefore, was a natural choice. Using a Point Cloud survey of the original building and newly acquired adjacent properties, Space created a BIM model of the project proposals. From this, 3D models of the original and new buildings were created, providing all stakeholders with a clear idea of the design direction. A year on from the start of construction, the original theatre has been extended to allow for space to create the children’s theatre, gain more capacity and provide new social and circulation space for front or house use and contemporary technical facilities back of house. In accordance with the strategic plan, this has involved acquiring further buildings from the 1900s that until recently housed shops, plus an old unused Edwardian fire station. As one of the key drivers for this project was to restore the Grade II theatre to its original splendour, it was important for Space to ensure that any new build elements should be clearly distinct from the historic fabric. As such, wherever possible, new accommodation is separated from the original fabric by sizable social and circulation spaces which have been given a lightweight feel thanks to fully glazed facades. These not only create open, naturally lit spaces, but also allow the original brick walls of the historic buildings to be viewed both internally and externally. David Coundon, Architectural Director at Space Architects noted; “It has been thoroughly rewarding to be given the opportunity to nurture the theatre back to its original beauty and to create a sustainable cultural centre fit for the 21st Century. Lynda Winstanley, Theatre Director, said: “Space Architects has taken great care to listen to us at every stage, ensuring all key stakeholders were on board with their plans from the beginning. The new Darlington Hippodrome theatre is set to open in November 2017.